Four UWA-linked swimmers and two pole vaulters will vie for gold at the Commonwealth Games on the Gold Coast next month. UWA-West Coast swimmers Blair Evans, Brianna Throssell and Zac Incerti all made the squad, along with UWA alumni Holly Barratt, who at 31-years-of-age will be one of the oldest in the swim team. The Rockingham swimmer previously represented UWA at the World University Games and was named 2015 UWA Sports Star of the Year. At the 2018 Hancock Prospecting Australian Swimming Trials held last week on the Gold Coast, swim star Blair Evans took out gold in both the 200m and 400m individual medley category, repeating her success in the state swimming championships in January. Brianna Throssell also found success at the trials, taking silver and bronze respectively in the 100m and 200m butterfly. She narrowly missed a podium place in the 100m freestyle where she finished fourth. Zac Incerti also struck gold on the last day of the tournament, with a clear win in the 50m backstroke. Originally from Broome, Zac took up competitive swimming at UWA-West Coast at age 18 and hasn’t looked back since. Elsewhere, a number of other UWA club swimmers pushed boundaries to get to the finals in their events. Young duo Jemima Horwood and Kara Broadbridge both made the 50m freestyle final, beating out many more experienced swimmers, and found themselves up against Commonwealth record holder Cate Campbell. UWA student athlete Alex Milligan fell short in the 200m breaststroke, with a time of 2:12.25 keeping him out of the top three by one place. Fellow student athlete Tamsin Cook won her heat with ease, but didn’t post a fast enough time to make the finals. UWA Athletics Club pole vaulter Nina Kennedy and fellow UWA Athletics Club athlete Liz Parnov will also be packing their bags for the Commonwealth Games after scoring spots in the Aussie team. Perth pole vaulter Nina was recently elevated into the top 12 in the world after a stunning win at the Australian Championships in February with a personal best of 4.71m. Liz Parnov came in at second place, while sister Vicky Parnov came in at equal third with a height of 4.10m. Alex Parnov coaches daughters Liz and Vicky, as well as Nina Kennedy. The 2018 Commonwealth Games will be held on the Gold Coast from April 4-15, with 18 sports represented including swimming, triathlon, table tennis, netball, hockey, Rugby Sevens and weightlifting. From Uniview and the whole of the UWA community, the very best of luck to our athletes competing in April. 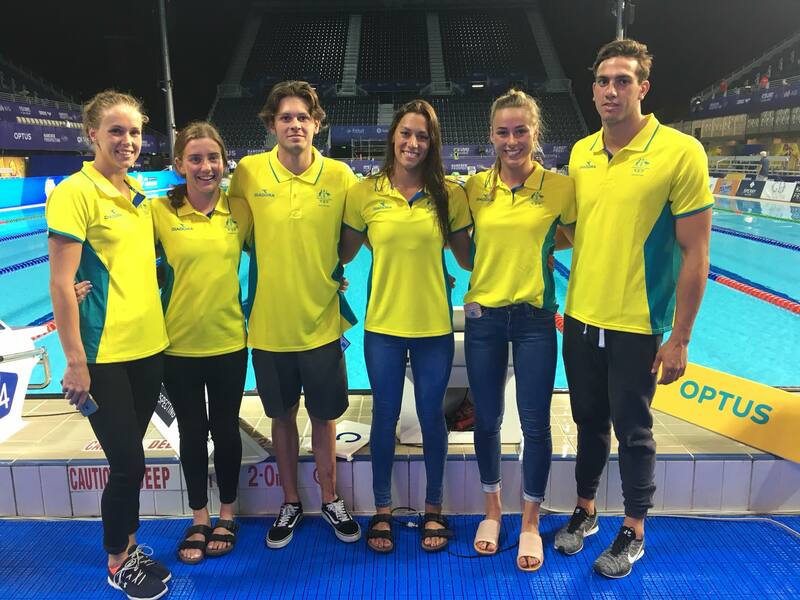 UWA-linked swimmers who have been included in the team for the Commonwealth Games include alumni Holly Barratt (far left of frame) and Blair Evans (middle), Brianna Throssell (right of Blair) and Zac Incerti (far right).